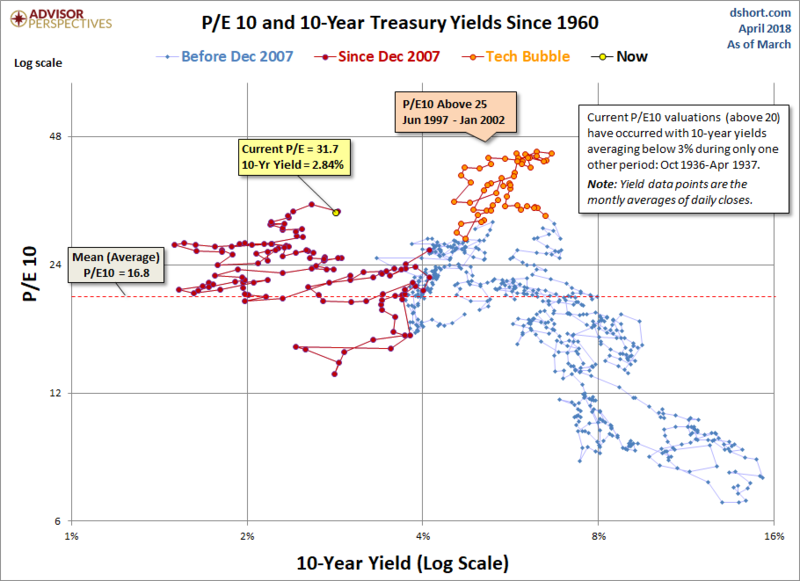 "Never in History Have We Had 20+ P/E10 Ratios With Yields Below 2.5%"
We’re all familiar with the common-sense definition of insanity: Repeating the same behavior time and time again and expecting different results. Here’s a more specific one: ZIRP rates against a backdrop of sky-high overvalued stocks. Unless you are one of the relatively few investors savvy enough to buy silver or gold, ZIRP essentially forces money into the stock market, because nothing else yields anything. This extreme and artificial shunting of investment dollars into a stock market whose fundamentals are perilously shaky and outrageously overstretched (many public companies only exist at all anymore due to ZIRP debt life support) is a house of cards of tremendous magnitude. But these are different times. The economic cycle shaped by the Financial Crisis that began emerging in 2007 shortly after the Bear Stearns hedge funds collapsed. The Fed began its historic crusade in cutting the overnight rate from an average of 5.25% prior to the hedge fund collapse to ZIRP (Zero Interest Rate Policy) as of December 16, 2008. In the months following the Great Financial Crisis, we have essentially been in "uncharted" territory. Never in history have we had 20+ P/E10 ratios with yields below 2.5%. The latest monthly average of daily closes on the 10-year yield is at 2.84%, which is above its all-time monthly average low of 1.50% in July 2016. What can we conclude? We have been in "uncharted" territory. Despite the end of QE, many analysts assume that Fed intervention through its Zero Interest Rate Policy (ZIRP), will keep yields in the basement for a prolonged period, thus continuing to promote a risk-on skew to investment strategies despite weak fundamentals.